Rivera Scariazzo is made from an indigenous, Italian grape called Fiano. The Fiano grape grows mostly in the Southern part of Italy, known for creating white wines with agebility. 20% of the juice is fermented in new French oak barriques and the rest in stainless steel tanks. The wine rests for 6 months in glass lined cement vats on the lees. It is a complex white wine; a deep yellow with an intense layered bouquet of flowers, mineral, a multi-layered palate supported by good acidity. You can cellar this for up to 4 years, but that might be hard to do…it’s a wine you’ll want to enjoy now and often! 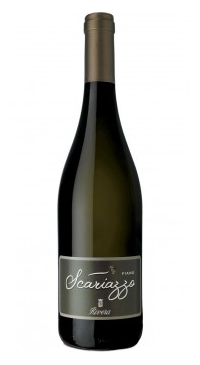 This wine has very complex aromas of honey, spice, hazelnut and briny cheese. A portion spent time in new French oak barrels which contributes to the beautiful weight of this wine on the palate. There are more than 500 different grape varieties in Italy and, trust me, this is one that’s absolutely worth trying. Pair it with various cheeses, gnocchi or a caprese salad. Enjoy! !